A deer’s natural diet consists of grasses, shrubs, and flowering plants. Not on that list: Subway bread. 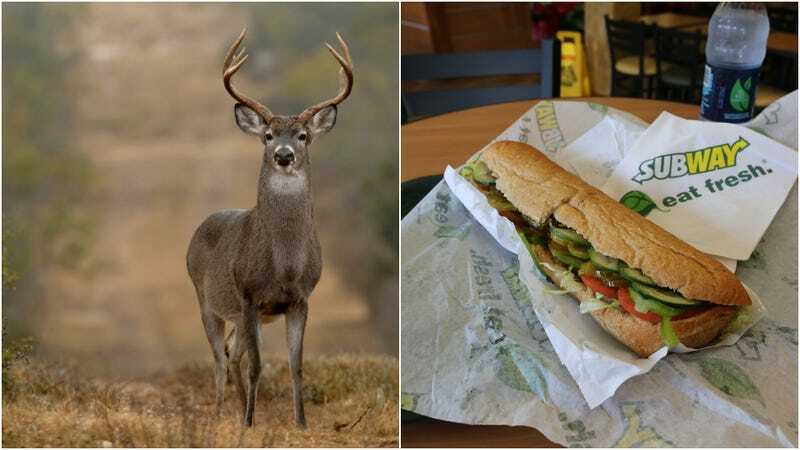 So Colorado Parks And Wildlife has issued a stern warning to employees of a Subway restaurant in Georgetown, Colorado, who have been filmed offering leftover rolls to a herd of deer: Stop it, or face a citation. KDVR reports that residents have seen a herd of about 10 deer hanging out around the Subway, waiting for a discarded Honey Oat loaf or hunk of 9-Grain Wheat. “When I pulled my camera out to get a picture, a footlong hoagie went flying by me and he was chucking them Peyton Manning style,” resident Dustin Schaefer told KDVR, using a vivid sports metaphor of the sort reporters can only pray for. In response, the Colorado state agency issued a firm warning and said that another violation could result in a $50 fine. The Parks And Wildlife website is clear about not feeding ruminates like deer and elk, as doing so brings them closer to dangerous traffic, disrupts their natural feeding schedules, can increase disease and stress, and could even harm the animals’ digestion. It also notes that feeding wildlife including deer, elk, pronghorn, mountain goats, bighorn sheep, mountain lions, and bears, is illegal. “It’s not good for the animal. Deer can also get very aggressive. It’s their natural instinct, because they have a lot of testosterone running through them right now and they’re kind of revved up,” Jason Clay, a spokesperson with Colorado Parks and Wildlife, told KDVR. So, unless you want a pack of aggressively macho, carb-loaded deer rampaging around your peaceful hamlet, Georgetown, please stop letting them snack on your footlongs.